It was just three paragraphs, but the conclusion of Sharon McGowan’s 1976 school funding investigation caused a political stir in Illinois. McGowan had discovered that $85.5 million in federal funding earmarked to help Chicago’s 212,434 “poverty children” in the 1974-75 school year had been instead spent for general purposes throughout the public school district. The fund, created by Title I of the federal Elementary and Secondary Education Act of 1965, was intended to improve academic performance at schools with a high percentage of low-income students, most of whom were black. “I made a mistake in not realizing that it was the most important part of the story. It would have been better in retrospect if I had led with that,” said McGowan, now the editor-in-chief of the Milwaukee Neighborhood News Service. In the summer of 1975, Stephan Garnett was fresh out of college and in his first journalism job at The Chicago Reporter. He was assigned to investigate the Chicago Park District’s funding practices. He soon ran into an obstacle: The district would release data on the number of seesaws or soccer fields in the parks–but not how much money went to each park. So he followed the advice of Reporter founder John A. McDermott: Do some legwork and visit the hundreds of parks and play lots across the city. “I looked at everything from the huge parks–Washington, Lincoln, Douglas–to the tiniest play lots,” he recalls today. In November, a federal jury ordered the City of Chicago to pay $850,000 in damages to Karolina Obrycka, a bartender who was beaten in 2007 by off-duty Chicago police officer Anthony Abbate. The beating had been captured by surveillance video: Abbate pushed Obrycka to the ground and repeatedly punched and kicked her after she stopped him from going behind the bar. The video was sensational enough, but the incident attracted media attention for the Chicago Police Department’s alleged attempt to downplay and cover up the beating. According to court documents, officers who responded to the incident that night allegedly failed to report Abbate’s last name and occupation, let alone the existence of surveillance video. Abbate and at least one fellow police officer also allegedly threatened to falsely arrest Obrycka for cocaine possession, and a bribe was offered with the promise that her medical bills would be paid, provided she remained quiet. Ann Grimes and Laura S. Washington were no strangers to taking on a challenging project, but when TV producer Scott Craig asked The Chicago Reporter to collaborate with him on a full-scale investigation into Chicago Public Schools, the duo found that it was trying from the get-go. The task: Find an “average” Chicago high school. Not the best, nor the worst, to paint a fair depiction of the city’s public schools. Grimes and Washington found South Shore High School, a place with both inadequacies and progress–in test scores, vocational training and other programs. When they rolled into South Shore, cameras and a production crew in tow, then-Principal William Marshall was cooperative but defensive. Though the reporters’ decision to investigate the high school was motivated by a desire to be fair and balanced, many were suspicious. Its one-mile oval of green turf sits beneath a clear blue sky, eliciting an elegant appearance and experience. But the Arlington International Racecourse in Chicago’s Northwest suburbs had a secret, and it wasn’t pretty. Danielle Gordon took an official tour of Arlington’s pristine grounds on the suspicion that something was awry. Instead of spending the hour on the sanctioned route, she changed course and happened upon the backstretch. Next to the horse stables and hidden from the crowds were 12-by-12 dormitories made of concrete blocks. When Sarah Karp looks back on her 2000 investigation into Illinois’ juvenile transfer law, what she remembers is a series of images: 15- and 16-year-olds walking into criminal courtrooms at 26th Street and California Avenue, where they were being tried as adults. She couldn’t help but think they seemed completely out of place. “You’d just feel like, ‘Now, that’s a baby at that age, and yet they’re in adult jail,’” said Karp, who is now deputy editor at Catalyst Chicago. 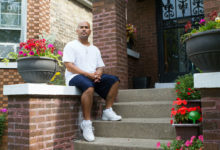 Karp’s story found that poor minority youth in Chicago were disproportionately affected by the state’s juvenile transfer law. She reported that 15- and 16-year-olds were being tried as adults if they were charged with selling drugs within 1,000 feet of a school or public housing site. Shortly after The Chicago Reporter published its latest investigation into mortgage lending practices in 2007, it received a call from an unexpected place: Illinois Attorney General Lisa Madigan’s office. Madigan was interested in the Reporter’s data analysis that showed high-cost loans were being steered disproportionately toward African-American and Latino applicants. She used the Reporter’s findings to file lawsuits against two of the country’s major lending forces: Countrywide Financial Corporation and Wells Fargo and Company. In 2011, the discriminatory lending case against Countrywide resulted in a $355 million settlement. A year later, Madigan struck a $175 million settlement with Wells Fargo. Just before Jeff Kelly Lowenstein’s 2009 nursing home investigation hit the press, the story became all too real with the sudden death of an elderly African-American man named Bennie. Bennie Saxon, an 84-year-old with dementia, fell from a four-story window at Alden Wentworth Rehabilitation and Health Care Center in Greater Grand Crossing on the city’s South Side. Business practices at the facility, owned by Floyd Schlossberg, exemplified what was wrong with Chicago’s nursing homes. Nursing Home Compare, the federal data portal that rates all Medicare- and Medicaid-certified nursing homes, gave the highest grades to two of Schlossberg’s homes with a majority-white population in 2009, Kelly Lowenstein found. But Schlossberg’s majority-black homes, including Alden Wentworth, received failing grades. Robert J. Quinn’s tenure as commissioner of the Chicago Fire Department spanned the Daley Machine era. 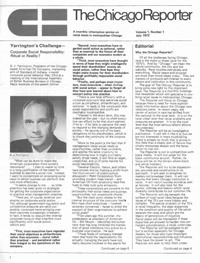 Quinn took over the department in 1957, two years into Mayor Richard J. Daley’s first term. His subsequent 21 years in office made him a Chicago institution in his own right. Today, the city’s fire academy bears his name as a tribute. But the beginning and end of Quinn’s career were marked by crisis: In 1958, with a massive and deadly school fire at Our Lady of the Angels, and with a pair of Chicago Reporter stories that examined the fire department’s poor performance in the 1970s.